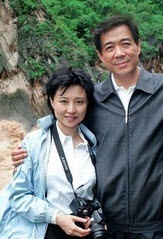 Photo Source: Bo Xilai and his wife, Gu Kailai, Financial Times, April 10, 2012. In the way of an update regarding Wang Lijun, the former vice mayor of Chongqing, the earlier story continues to evolves in different directions. 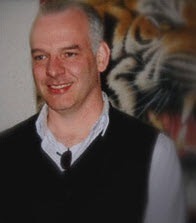 While the fate of Wang still remains pending, though seemingly less discussed in the media, including the social media, the story very broadly appears to have affected the lives of many others, such as Bo Xilai, his wife, Gu Kailai, and a Bo family servant, and even now deceased or murdered British businessman Neil Heywood. 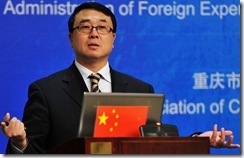 On February 8, 2012, Wang Lijun, then deputy mayor of Chongqing, reportedly attempted to defect to the United States. Although the rumors regarding his earlier disappearance were many, the story about his attempt to detect now appears to be the general consensus or simply the truth story behind his disappearance. In other words, the rumor about his visit to the U.S. embassy was confirmed. As of today, the consequences of his actions, however, are still pending. Then there is Wang’s relationship to Bo Xilai. During this earlier period, Bo was then the Communist party municipal secretary of Chongqing, and Wang’s superior. Photo Source; In this Oct. 16, 2011 photo, Wang Lijun, the former Chongqing city police chief, delivers a speech during the 2nd International Forensic Science Meeting in Chongqing city.Color China Photo, via Associated Press; (Didi Kirsten Tatlow, Inside China’s Greatest Mystery, New York Times, February 12, 2012). Accordingly, he sought refuge in the U.S. consulate in Chengdu, China, because, “many speculate that” Mr. Wang sought Mr. Bo’s protection when the investigation appeared to be getting close to him, but that Mr. Bo rebuffed him,” (Jamil Anderlini, Police chief turns against former mentor, Financial Times, February 13, 2012). In the aftermath of humors surrounding Wang’s attempt to defect and Wang’s relationship to Bo, eventually Bo Xilai, one of China’s most high-flying communist officials and a contender for its top leadership, was purged by Chinese party members in the most significant political upheaval in the country in two decades. Thus came the ending of Bo’s political career. Photo Source: “Gu Kailai has been implicated in the death of Neil Heywood”; China: Leader’s Wife Linked To Brit’s Murder, NewsSky.com, April 11, 2012. The story did not stop evolving at that point, however. This is because, on April 10, 2012, the Financial Times reported that the wife of Bo Xilai, Gu Kailia, and their family servant are now under arrest. In what amounted to a formal government announcement, state media also said Mr. Bo’s wife, Gu Kailai, and a Bo family servant had been “transferred to judicial authorities” on suspicion of having murdered Mr. Heywood, who was found dead in a hotel room in Chongqing on November 15. Mr. Heywood was a close associate and “foreign consigliere” to the Bo family. Mr. Bo was removed from his position as Communist party chief of Chongqing last month. According to the state media report, a police investigation found that Ms Gu and Mr Heywood had fallen out over a “conflict over economic interests”. As earlier mentioned the story about Wang Lijun, the former vice mayor of Chongqing, continues to evolves in different directions. In the end, the fate of Wang Lijun may be an arrest and conviction for treason when attempting to defect to the United States. However, there are also rumors, supposedly from some Chinese officials, which, according to the Financial Times, suggest the possibility of Wang being shown clemency or some sort of lenient treatment for helping bring down Bo Xilai.